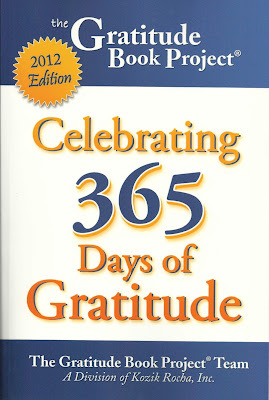 "Celebrating 365 Days of Gratitude" book event, Feb. 4th at Florey's! Florey's Book Co. welcomes author Kathy Scheiern, as she discusses the new book "The Gratitude Book Project: Celebrating 365 Days of Gratitude"
"The Gratitude Project Book" is a collaborative book featuring over 300 authors answering the question “What are you grateful for?” in 200 words or less, with National Book Sale Proceeds Benefitting Three Charitable Organizations. 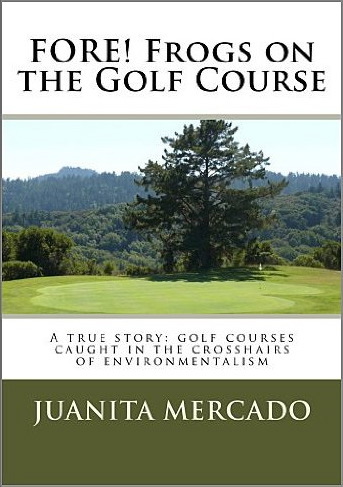 In keeping with the spirit of the project, net proceeds from national book sales will be split among three charitable organizations: Feeding America, Women for Women International and the American Society for the Prevention of Cruelty to Animals (ASPCA). 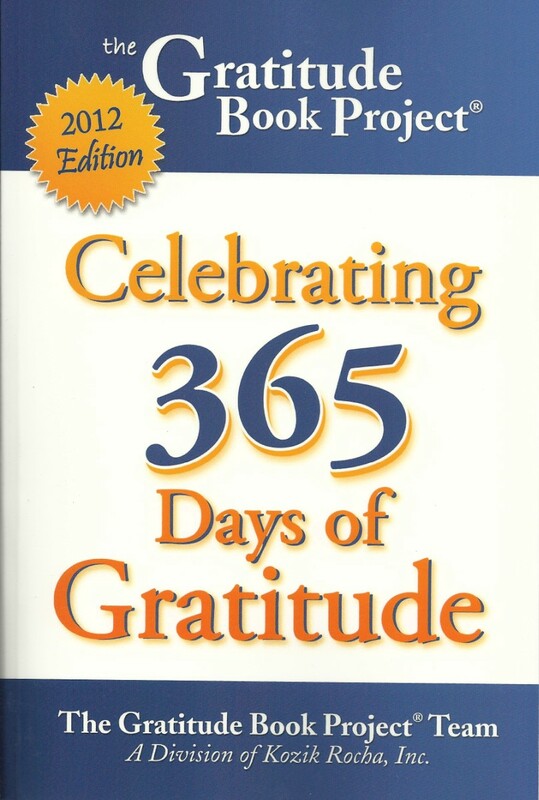 The book shares compelling stories of appreciation and evidence that harnessing the power of gratitude can be a life-changing force. The difference between saying thank you—good manners—and living in gratitude—great life skill—are illustrated in moving pieces. Kathy Scheiern made four contributions to the book. One to her mother for the gift of life and one to her father for his honesty and his faith. She also contributed an entry about being grateful for everything! And her final entry was about being grateful for the simple lessons of a walk in the woods. Kathy is also a C.P.A. and a former financial executive who studied with a shaman and enjoys creating and performing ceremonies as a licensed minister! "Fore! Frogs on the Golf Course" Book Signing, Jan.21st at Florey's! "Benefits of a Healthy Spine" workshop at Florey's! Florey's Book Co. invites you to the "Benefits of a Healthy Spine" workshop. 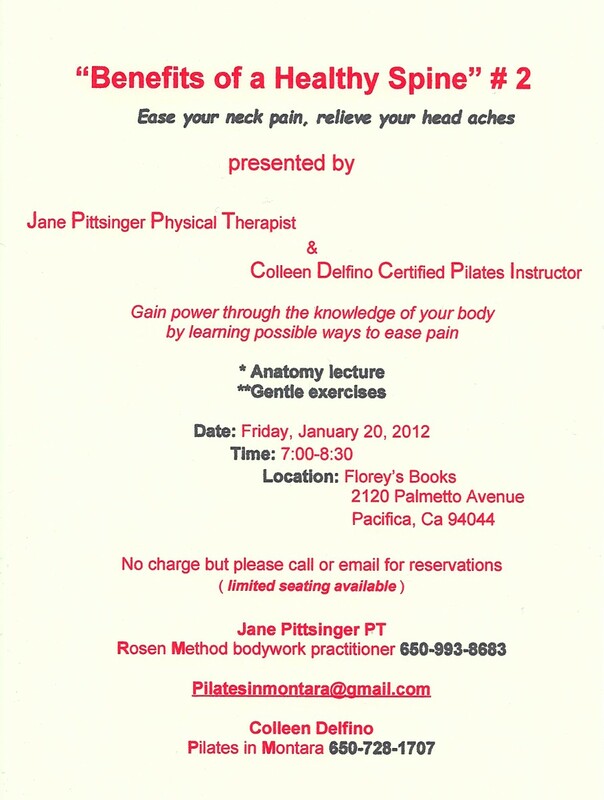 The workshop will be presented by Jane Pittsinger, Physical Therapist and Colleen Delfino, Certified Pilates Instructor. 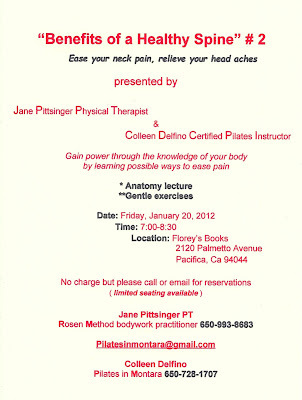 Gain power through the knowledge of your body by learning possible ways to ease pain. There will be an introductory anatomy lecture, followed by demonstrations of gentle exercises. This event is free, but please call or email for reservations, as available seating is limited. 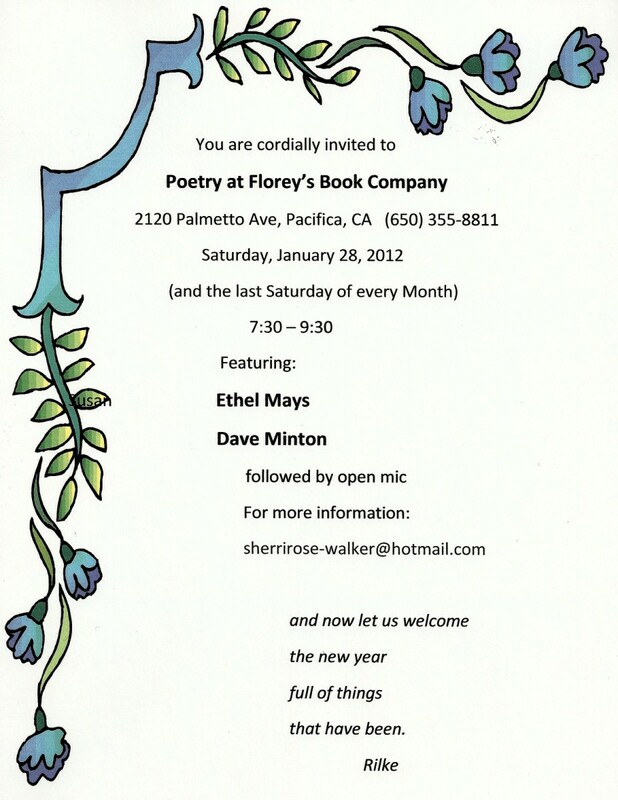 The featured poets this month are: Ethel Mays and Dave Minton. The featured poets will be followed by an open mic period. Open mic sign-up is first come, first served. This event is also open to the public and free of charge. "Angels and Spirit Guides" Book Signing, Jan.14th at Florey's! 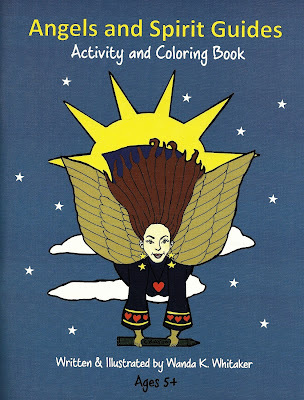 Florey's Books welcomes local author Wanda K. Whitaker as she presents her new book "Angels and Spirit Guides Activity and Coloring Book". The book, geared towards children 5+, their families and friends, describes Archangels, Guardian Angels and Spirit Guides and the specific roles they play in the celestial realm and the differences between them. 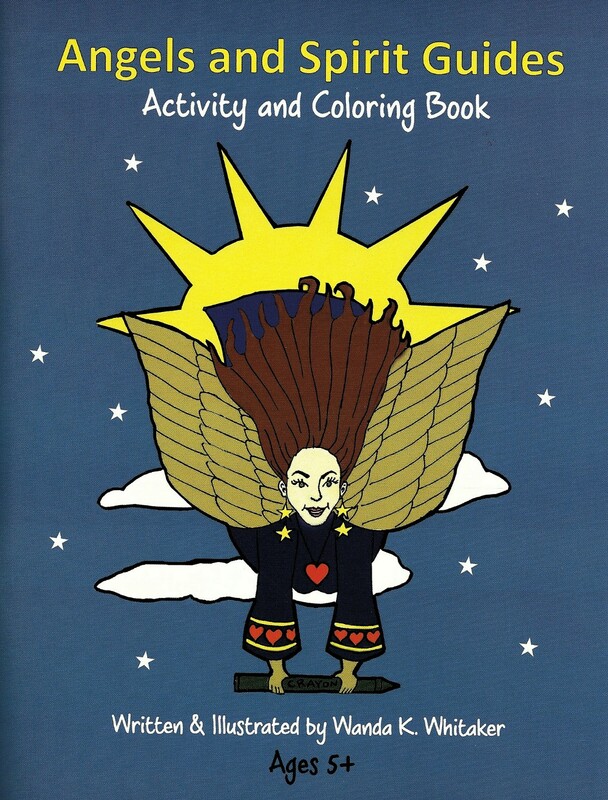 The coloring and activity book format, offers young readers a creative way to express and comprehend the special spiritual assistance that is always around them. The 56-page book features nine Archangels including Metatron, Micheal, Gabriel, Raphael, Uriel, Ariel, Chamuel, Raguel, and Zadkiel, information about Guardian Angels and Spirit Guides in many different cultures in action scenes depicting them helping a skateboarder to helping a child to become a rock star. Activities encourage positive thinking and self-talk, address reading comprehension as well as spark spiritual and personal growth. "I created this endeavor because my life purpose is to inspire and empower individuals to awaken to their higher selves and greatest potential. Ever since childhood I had a passion for drawing and painting and helping others. I graduated from the University of Maryland, College Park where I majored in Communications and minored in Art Studio. I began a practice in the healing arts as a passion to complement the counseling of many friends and family members as well as myself by avidly reading over 1,000 science and metaphysical publications and taking various classes both to heal myself and for instructional purposes. For several years, I studied hypnotherapy at the Palo Alto School of Hypnotherapy and became a certified hypnotherapist. Additionally, I practice Reiki and other energy healing modalities to complement my services and was certified by Possibilities DNA as an emotional healing practitioner utilizing a unique numerical mapping process to eliminate energy interference patterns held in the body. I'm forever studying and learning more and more new practices to add to my portfolio offering clients a variety of holistic solutions to life's challenges.